Kevin Durant caught flack for signing with the greatest regular-season team in NBA history. And if he’s looking for approval from those critics, Durant could do the exact opposite with the Knicks. Maybe that’s part of the appeal. While his star client becomes roiled if you utter “Knicks” in his presence, lifelong Orange and Blue fan Richard Kleiman likely would welcome it. It was the same result between the Pistons and Knicks in this second leg of a home-and-home, as Detroit took down New York, 120-103, on Friday night. It was Saturday’s best college basketball matchup when No. 2-ranked Duke visited No. 3 Virginia for a tough ACC matchup. But Duke, once again, came away with the victory, 81-71, as they continue to show their dominance this season. Since coming over in the blockbuster trade with the Mavericks, Dennis Smith Jr. has been the Knicks’ entire offense. And that’s not an exaggeration. 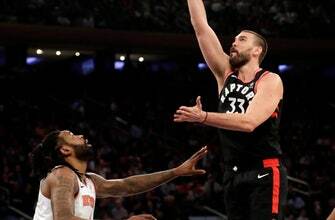 The Knicks, losers of 15 straight games, take on the new-look Toronto Raptors on Saturday night at Madison Square Garden.